We all know the bond between dogs and humans is very powerful and meaningful – but a group of researchers took it to the next level. They wanted to see how this relationship actually mirrors the one between a parent and a child. The researchers, from Massachusetts General Hospital, have detailed their findings in the journal PLOS ONE. Scientists enrolled women with children aged 2 to 10 and one pet dog which has been in the household for at least two years. They wanted to see how the mother feels towards the dog, and how these feelings related to what she feels towards the child. To study this, they had the participants watch photos of their child and dog, and then a strange child and dog and carried out functional magnetic resonance imaging of their brains. The imaging revealed both similarities and differences in the way important brain regions reacted to the pictures. 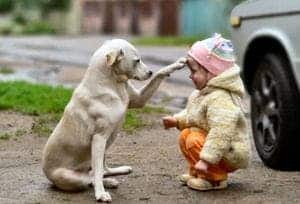 Areas which are related to important functions such as emotion, reward, affiliation, visual processing and social interaction all showed increased activity when participants viewed either their own child or their own dog. However, a region known to be important to bond formation – the substantia nigra/ventral tegmental area – was activated only in response to images of a participant’s own child. But on the other side, the fusiform gyrus, which is involved in facial recognition and other visual processing functions showed a greater response when the subjects were shown images of their dog. The results are quite suggestive, but difficult to accurately interpret. Naturally, the subjects are attached to both their children and their dogs. Researchers say these results need to be replicated at a larger scale before definite conclusions can be drawn. Based on these results, they believe that more light can be shed on how our brain reacts to our relationship to dogs.